Fred Malulani Beckley Kahea passing on traditional knowledge, 1922. In order to teach mat weaving [ulana moena], feather lei making [haku lei hulu], net tying [ka upena], and other Hawaiian skills, Fred Malulani Beckley Kahea initiated himself a class in the armory, beginning at seven o’clock this Thursday night. [I was reminded of this article by the recent post by Nanea Armstrong-Wassel about Fred Malulani Beckley Kahea and traditional featherworkers. 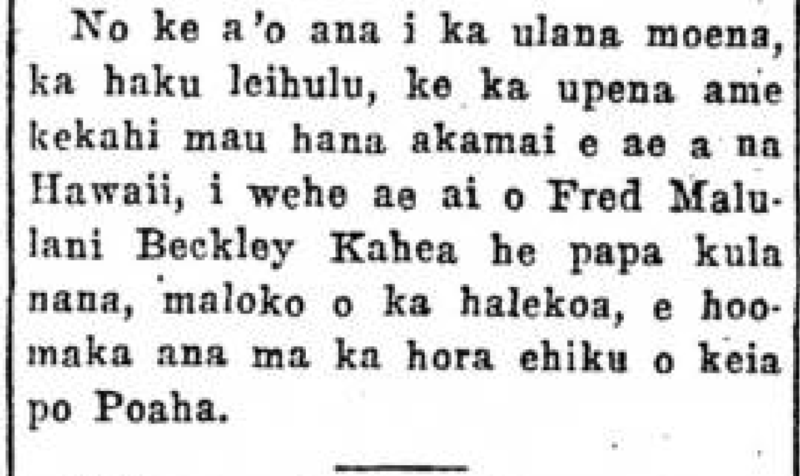 Ka Nupepa Kuokoa, Buke LXI, Helu 49, Aoao 8. Dekemaba 7, 1922.